Thousands of sheep are in their mountain pastures overlooking this town of 12,000, site of two previous winter Olympics, where the Cripple Creek Cloggers and Rigney Family Bluegrass arrived Monday for the concluding week of the International Festival of the Pyrenees. Jaca is called the "Pearl of the Pyrenees" and Steve Cates, Diirector, previously brought a troupe to this town in 1979 and was anxious for his current dancers to have this experience. Forty five groups from twenty nations are still arriving and the first parade of two scheduled for tonight will begin at 8:30. Temperatures are up to 90 at midday, but are cool for the evening and late evening activities. The Rutherford County dancers are joined by the Rigney Family Bluegrass from Normandy, TN for this tour. They finished their work at the French part of this festival on Sunday night with two shows in two different towns in the area of Quillan, their headquarters for that part of their tour. Performing Appalachian style square dancing with a clogging step, the troupe wears costumes of the mid 1800s in Middle TN, especially designed for them by Estelle Ansley Worrell, of Nashville. Instruments used for music are the bass, banjo, mandolin, guitar, and fiddle. They have received rave reviews from the festival organizers as well as from the general public. In a special presentation by the Mayor of Quillan on Monday morning, he expressed his personal gratitude for being able to host a U.S. group, a very rare situation here, and also praised the quality of musical and dance shows presented. He was especially surprised at the fact that the group is not a professional group, but open to all interested persons in the area of Murfreesboro and Middle Tennessee. 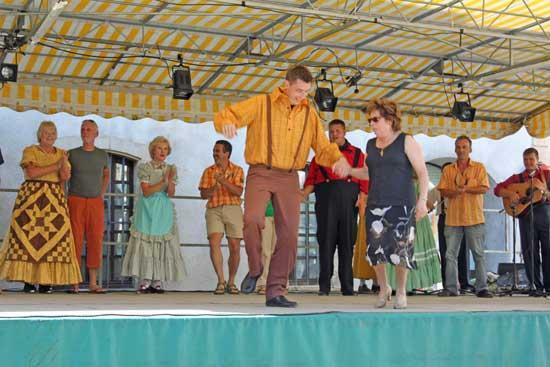 One special feature of the performances given by the Cripple Creek Cloggers is bringing audience members onstage to allow them to join in the dance. This is most unusual for groups performing at these festivals and much appreciated. The rest of the week will be spent in concert performances, parades and workshops in this area of Spain. One special opportunity of this festival is the chance to meet and get to know so many troupes from all over the world and to solicit the best of them for Murfreesboro´s International Folkfest next June 13-20. The group will return to Murfreesboro on August 3. Ida Satterfield, of Kimela Drive, in Woodbury, is one of the members of Cripple Creek Cloggers on this tour.